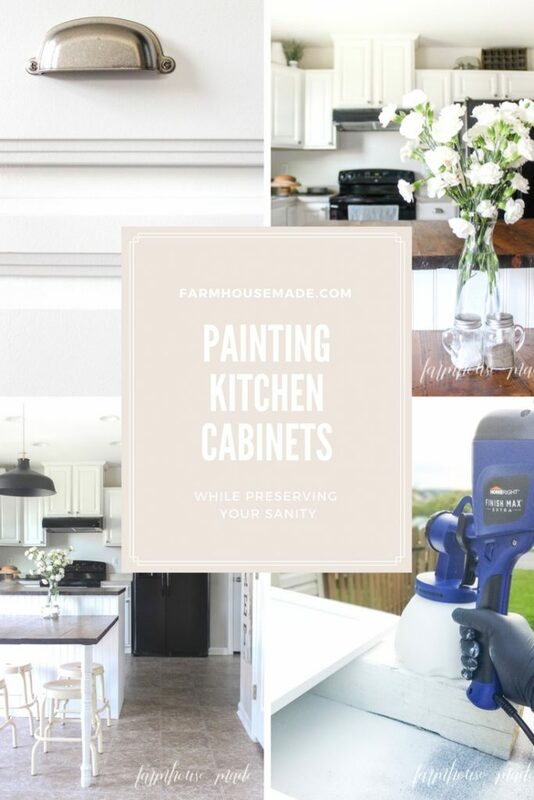 Painting kitchen cabinets can be a budget friendly DIY, or it can be a disaster if you don’t have the best paint, primer, sprayer, and tips! 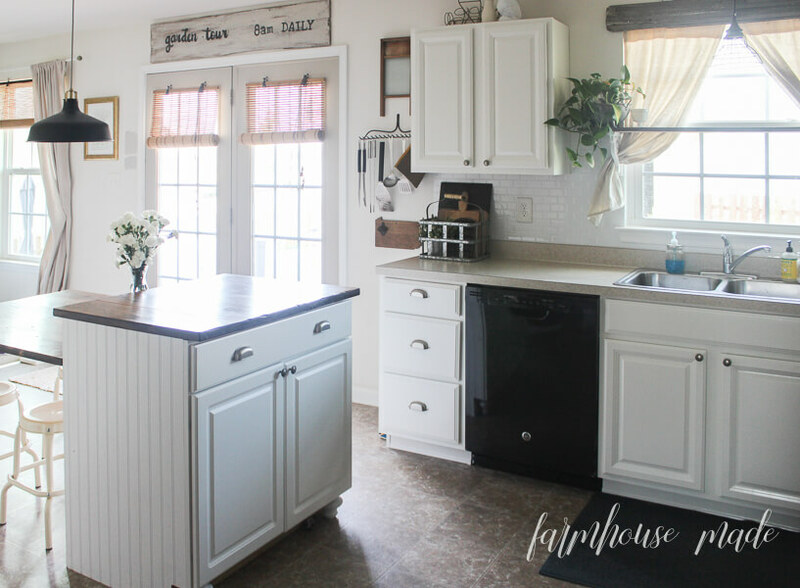 We upgraded our cabinets 4 years ago when we built this house, with every intention of painting them down the road. We used 2 upgrades (we got for free) from the builder to install these cabinets. There was a lot of wood grain involved with the base and upgrade 1 cabinet options, and I didn’t want to deal with that beast, so these maples won on the inlay style door, and because the antique white cabinets I loved were out of the budget (we got a porch instead). 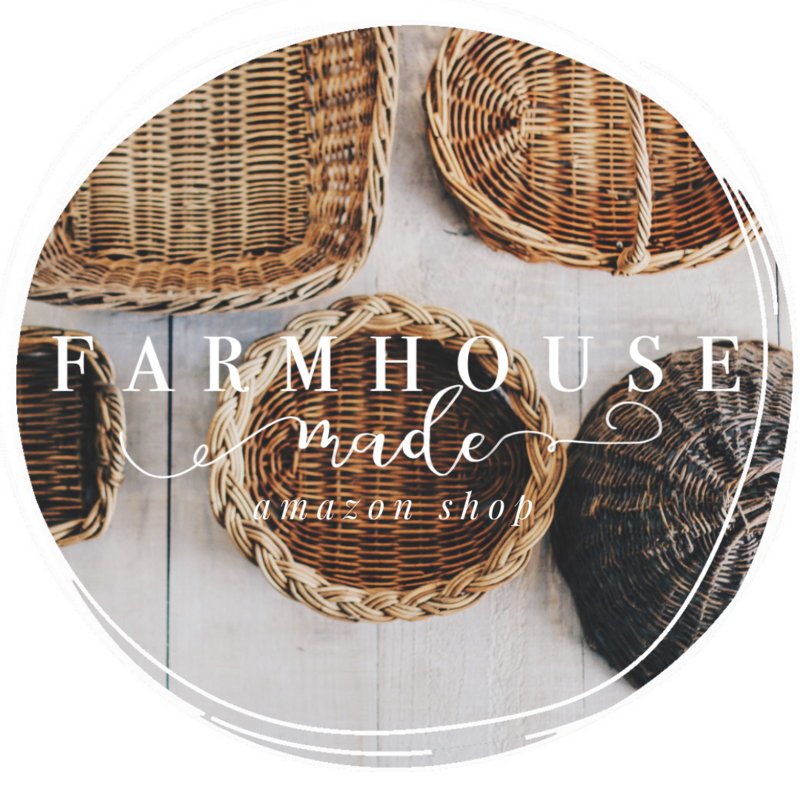 To read all about building the farmhouse, you can pop over here, it has it’s very own about page with it’s whole story and throwback photos. So, this is the 4-year-old kitchen, in all it’s before glory. 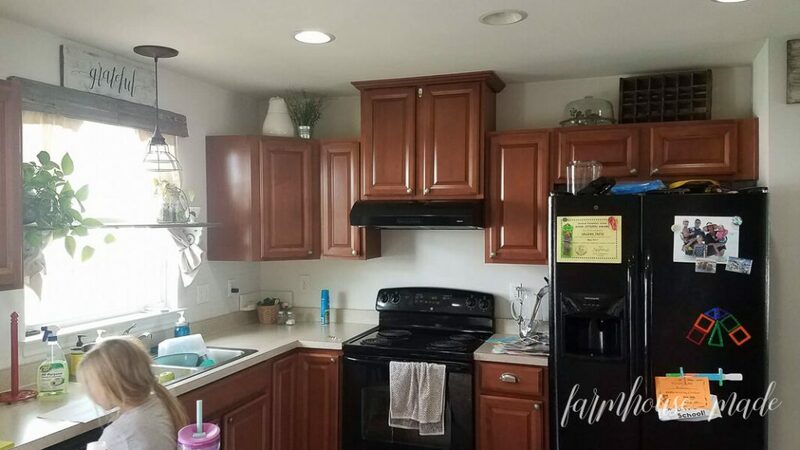 The kitchen/family room is in the back of the house, where it’s a bit darker as far as natural light goes, and these cabinets don’t help. Not to mention, they don’t balance at all with the living room (which, is white). Dishes in my sink, Lilly putting in her child labor hours by making labels for the door hardware to go in, random stuff on the top of my fridge I hide from the kids before I donate it. There are also 2 fishing rods up there behind the hidden donation items, and no paper towels. No, that light is not burnt out, we have no bulbs in the 2nd row of recessed lights because they are as bright as the sun itself. I’m also missing my wreath above the vent with the empty hook. People will tell you anything to make you think you can do such a huge time consuming project, with minimal effort, and get maximum results. Don’t believe everything you hear, because, I am sorry to say, that you do actually have to do it right if you don’t want paint chips to dip in your sadness. I also need to mention that my friends at HomeRight have sponsored this project, and that there are affiliate links in here, which you can learn more about here. I am only concerned with sharing things that are worth our hard earned dollars, will make your life easier, or your home comfier. Since we know you’re not dropping kids off for 2 weeks at your parents house while you watch paint and primer dry, they can help you stay organized. Lilly helped me by labeling bags for each cabinet door/drawer hardware. As I took off the doors and numbered them according to a little not-to-scale map I made, Lilly bagged the hardware and labeled each bag. 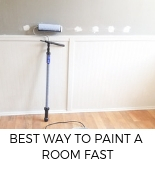 Use some painters tape (we use only FrogTape in this house) to block the areas you don’t want to paint, like along your floor, appliances, and the walls or ceiling areas. Did y’all know there is so much information on the back of those cans? I did not use Zinsser, but I do know the back of the can says to not clean with TSP, as these two things do not play well together. Plus, TSP leaves a residue behind, so you’re wiping all that down twice… nope. I also learned that ammonia completely evaporates like water (leaving no residue behind), so I decided to stick with that, and an open window. Sanding cabinets should be on your list, however you’re just sanding to rough them up, not get to bare wood. 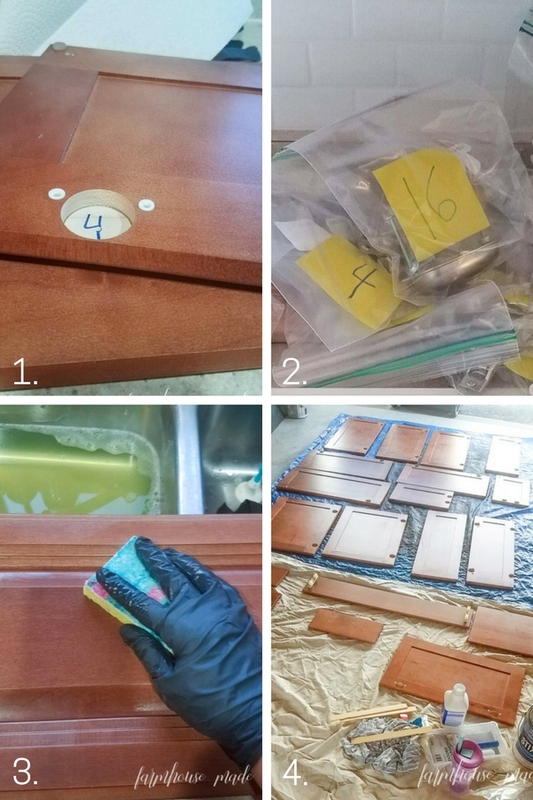 The sheen on my cabinets was pretty much removed with he ammonia (I’m guessing because I scrubbed them while degreasing them), so I opted to use a deglosser instead of sanding everything. Soak a rag, and rub it in a circular motion on the doors and boxes. Let it dry completely (I left mine sit for a few hours) before priming. I may grow to regret not sanding, or I may not. 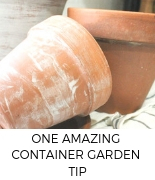 I roll the dice along with every other DIY blogger out there who hasn’t sanded. Further convincing me, the paint guys told me that Stix primer is super grippy, and deglosser would suffice. By far, the worst part of this undertaking (and any other paint project), is the prep. Once you have this done, the rest is a waiting game of logistics. This specific primer is able to recoat in 4-6 hours, while the BM Advanced may recoat in 14-16 hours. Sixteen hours. We have 3 kids, so that meant painting and priming in the evenings mostly, so your logistics are key. 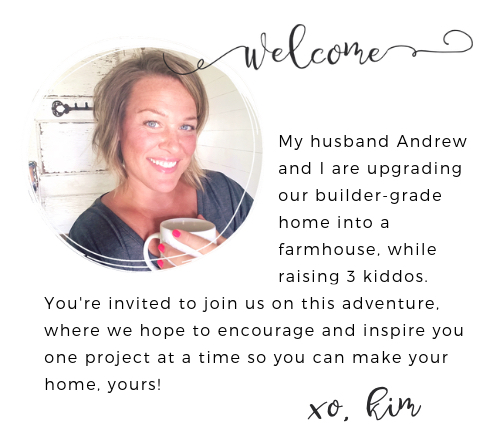 Our full timeline is down at the end of this post, but I basically did one coat of primer or paint each evening when the kids went to bed. I used the angled brush to paint the primer on the boxes, and smoothed it out with a foam roller. I did the same on the cabinet doors, making sure to get in all the grooves. This primer went on beautifully. Let this first coat dry for 4-6 hours. Priming the doors is a slow form of torture. I did not want to spray this primer on, but I have heard both yay and nay from various pros about spraying this primer. I chickened out and used the angled brush and roller to do 2 coats on the fronts and backs of the doors. Once you have 2 coats, let these chill for 24 hours. This is where the secret weapon comes in. 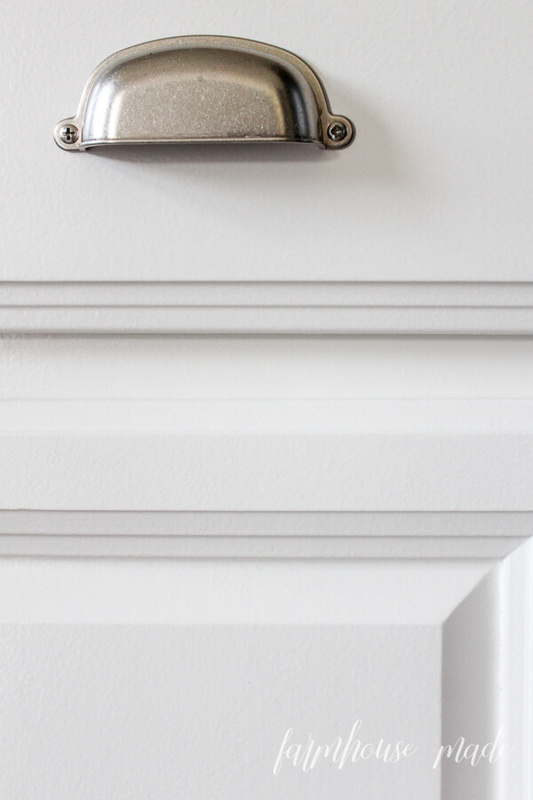 The HomeRight FinishMax Extra sprayer to smoothly coat the doors with 2 coats of Alabaster gorgeousness. 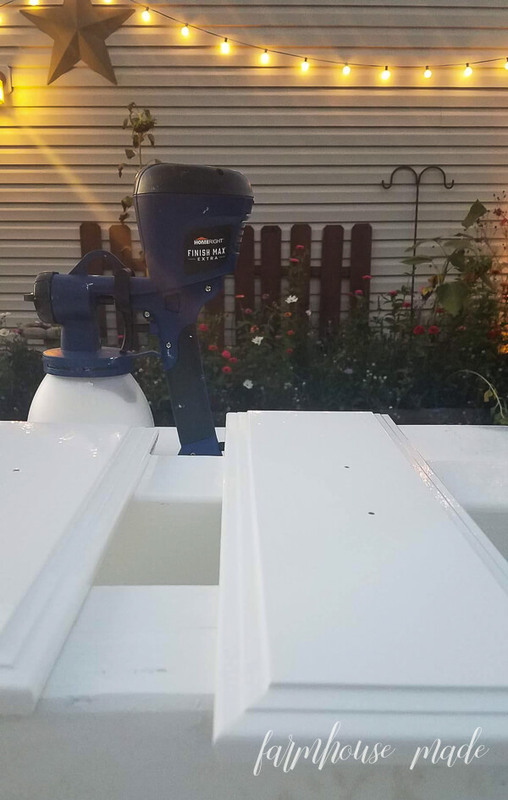 My favorite thing about this sprayer that makes it the perfect sprayer for painting kitchen cabinets, or anything for that matter, is that there’s no need to thin out the paint. 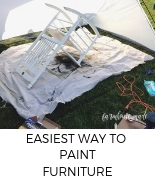 All you need to do it change a nozzle to accommodate different consistencies of paint, and you’re set. There’s also a lid! You can put a lid on the paint cup!! We set up our recycling bin, put a board on it to catch the overspray, put 2 pieces of wood (like runners) on top, spray the door, then Andrew would gently move the door in the garage to dry on the little runners. Repeat for the second coat, leaving it dry for 16 hours in between coats. For painting the boxes, I used the paint brush and mohair roller – the mohair is amazing and gives the smoothest finish! Paint takes time to cure and harden. All paint does, sometimes more or sometimes less. Follow the instructions on the can you have, but this paint takes 5-7 days to cure. The boxes had cured a full 5-7 days before I put the doors back on, and the doors got to bake in the 95-degree garage for about 4 full days. Gasp. The visual clutter from the open cabinets (not the fishing rods) was sending me over the edge, so I put the kitchen back together (gently) in the evening. When you go to reassemble and tear down that tape… please score the tape and paint gently with a utility knife just in case. 4 coats of paint can be pretty thick, and all your hard work is worth the extra 3 minutes of scoring. I really used to dislike our counters and floors with the old cabinets, but now I rather enjoy the flooring. The counters… I still am not a fan, but I don’t wince when I look at it! You may be wondering what’s with the half-finished backsplash. Friends, it is purely me, being very meh about the white SmartTiles (they’re beautiful and are holding up amazingly), I just want a real tile, or a printed tile, or some other tile. Marinating on that. The vent hood is getting an upgrade with a faux barn wood mantle, the cabinets will eventually get moulding, and there shall be feet added to the rest of the cabinets, and chunky legs to the island. Andrew doesn’t know this yet, so thanks for keeping a secret. 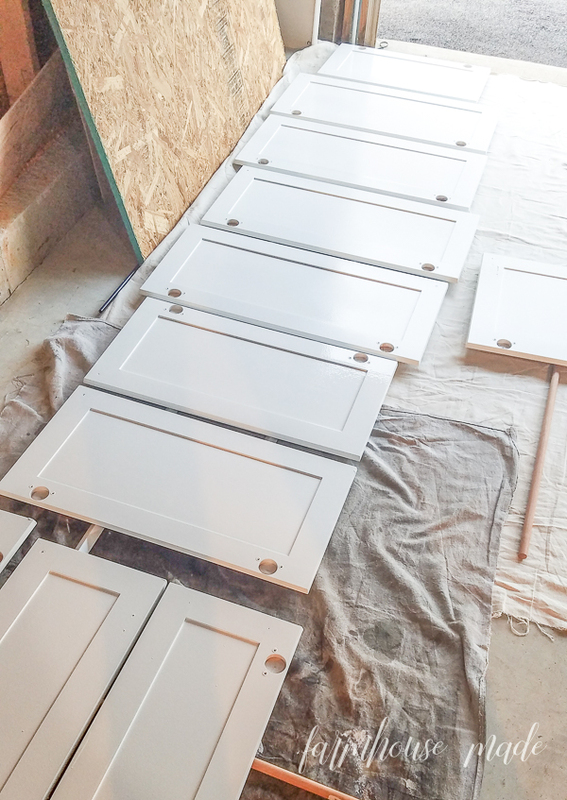 At the minimum, with maximum efficiency, you’ll need 1 day to prep, 1 to prime, 4 days to paint (if you do the boxes and doors together), and 7 to cure fully… totaling about 13 days. 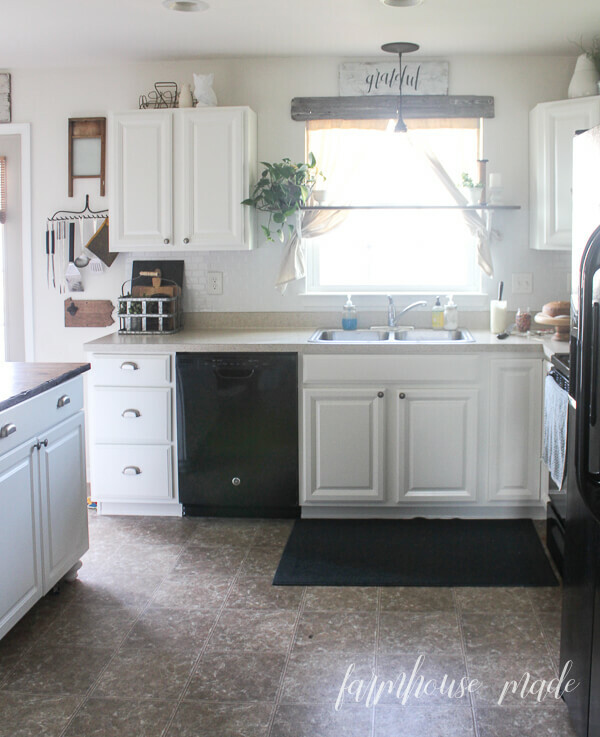 I am obsessed with how these turned out, and am so glad we upgraded the cabinets 4 years ago. Those antique white cabinets will be out of the budget until these cabinets fall off the walls! Wow, just wow looking at the before and after. 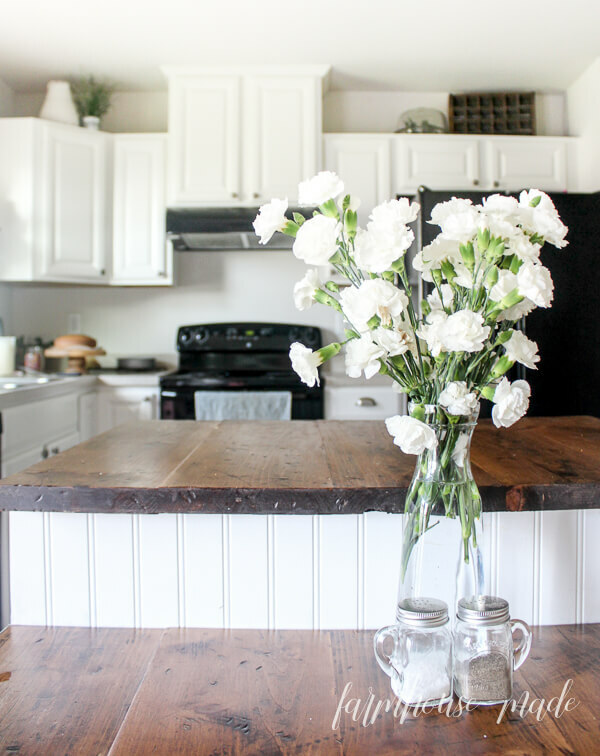 I love a white kitchen which is what I chose when we renovated. 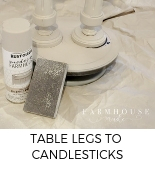 It’s like a blank slate for any decor color or style you want and now your beautiful table really stands out. You did it right taking your time and doing the prep. 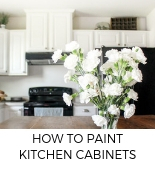 I am so suspicious of all those people who use chalk paint on their cabinets with no prep. They can’t look very good a year later, at least where the handles and pulls are. And the pink fishing pole? I wouldn’t have noticed it if you didn’t mention it. But that’s real life 😀 so it’s awesome! Absolutely beautiful & perfect! Awesome & amazing job. I’m definitely looking into the sprayer. Thanks so much for all the information & inspiration! Could you please tell me how you designed & made the counter/table. LOVE it. Looks perfect and completes the whole area. We used Sherwin Williams Waterborne Acrylic Enamel over Zinsser Bullseye 1-2-3 interior/exterior primer. The two products together resulted in a very tough finish that held up beautifully. Your kitchen looks fantastic! I LOVE the white cabinets. 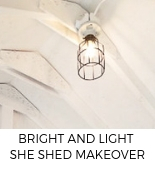 So much prettier and brighter than the ‘before’. Thanks so much for sharing. Thanks Anna! There certainly are a lot of factors that go into such a huge undertaking, aren’t there? 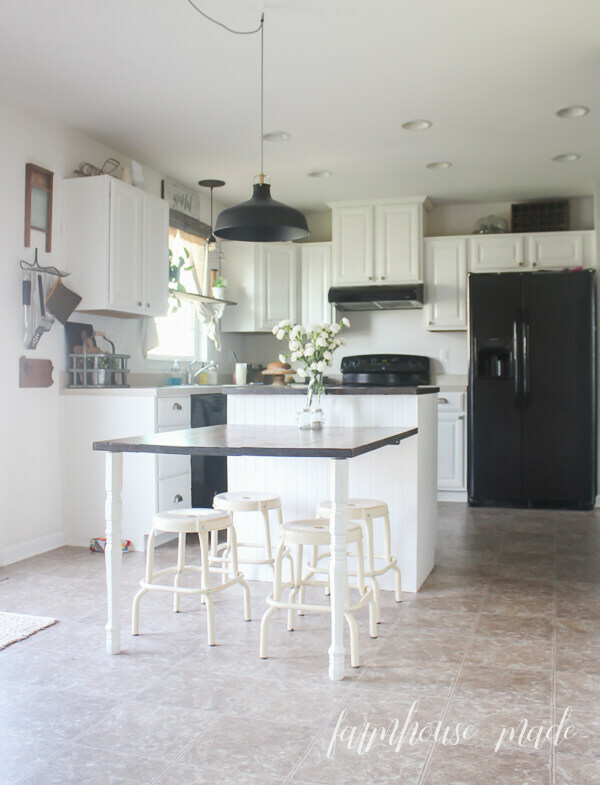 Your kitchen looks gorgeous! All that hard work certainly paid off. We had the most hideous grainy oak cabinets when we moved in 15 years ago. 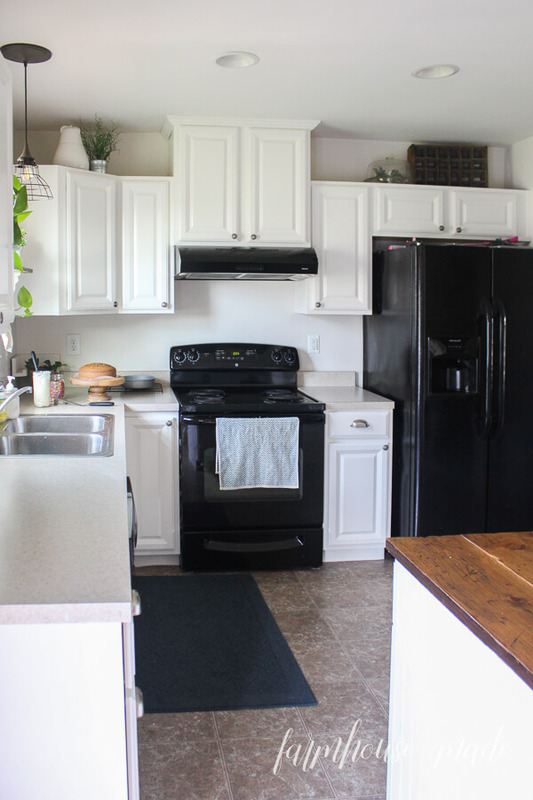 However, they were Kraftmaid, really nice cabinets, so we painted them white. Took off the hardware, sprayed them in the garage etc…. We also, because it was the thing back then, distress them with a little glaze, so I know how much work went into your kitchen. They still look great today and I still like them. Anyway, love your drawer pull choices and the rest of you kitchen decor. So pretty! Hey Patti! Thanks so much! I thought about glazing these, and making them a little antique-y, but I got scared that I’d totally mess it up! Lol I hope mine lasts as long as yours! I do wish I had seen your tip about scoring before removing tape.😩 I have a spot of paint missing on my island that pulled off with the tape. That’s so frustrating!!! My fave tape rarely lets me down, but, I have had the peely paint from thick coats a few times 🙁 Sadness!! Wow that was a lot of work but well worth it. 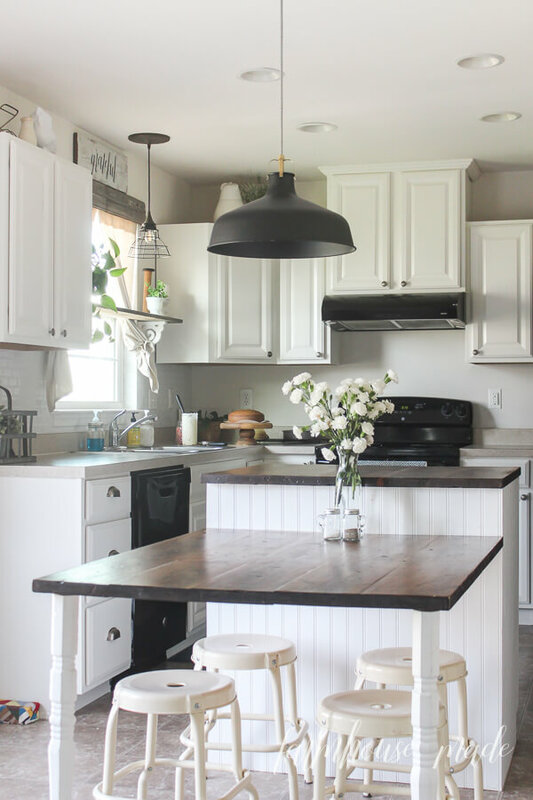 Your kitchen looks so much fresher and brighter now. Absolutely beautiful! 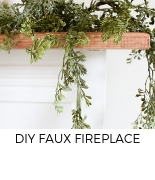 Fabulous instructions, this is the one I’m using for my cabinet redo! Thanks. Thank you so much!!!! 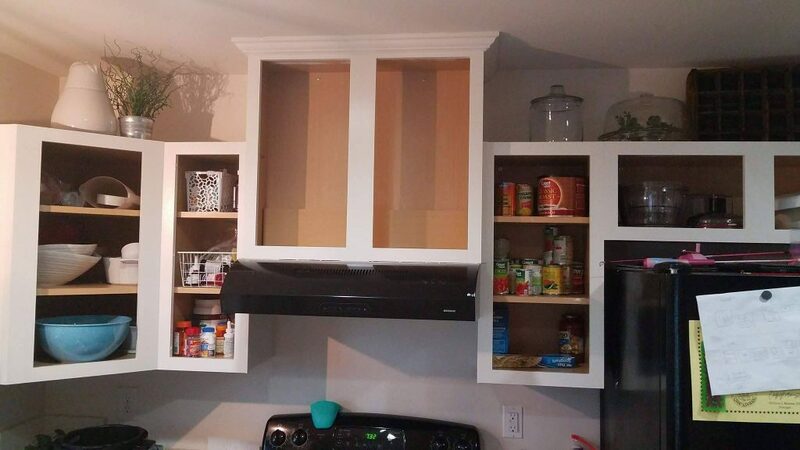 Your cabinets will look amazing! Hi- your tutorial was recommended by the 1915 blog. Getting ready to paint my cabinets! 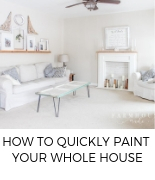 Did you use a topcoat over this Benjamin Moore paint? 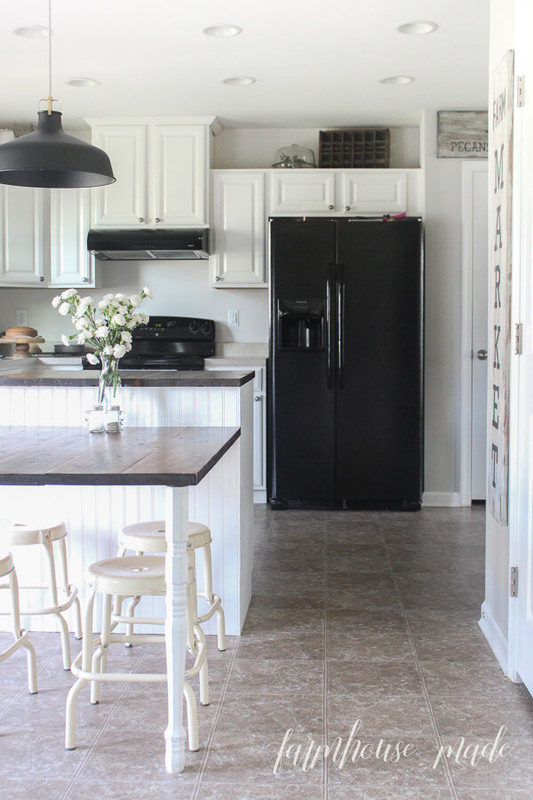 Have you seen any yellowing since you painted your cabinets? Thanks! Hi Jen!!! I did NOT use a topcoat, this Benjamin Moore Advance has a built-in topcoat. I did 2 coats of the primer, 2 coats of the BM Advanced in Alabaster, and that’s it! Nothing is yellowing, it’s been 8ish months since we did them and they are holding up beautifully. I clean them all the time (messy cook), and they do take a solid beating from my kids, stools, and zombie swords, and whatever else they do in there. The only chip I got was from one of my kids literally crashing into the cabinet drawers with a bike (lol) but I’ve touched that up and it’s looking perfect! They look gorgeous ! Am considering doing this to my dark cherry cabinets for a dramatic facelift. 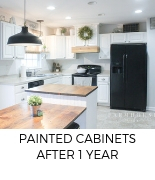 Did you paint the insides of the cabinets too with the same gloss removal and sanding process? If I left the inside dark wood it may look odd ? Hey Marissa!! Thank you so much!! I actually didn’t paint the insides of my cabinets (just the doors), I just left them as-is. The insides of mine were a tan color, so I let it go. If you think the darker insides would drive you nuts, you could totally paint the insides though with the exact same process. Let me know if you have any more questions! Your cabinets will look awesome!! Hi Heather! You can definitely paint the doors with a foam roller depending on what paint you’re using. Before choosing a roller for the boxes for the paint and primer, I decided to do the primer with the foam, and the mohair (velour is basically the same, Home Depot, Lowes, Benjamin Moore, and Sherwin Williams stores all carry one or the other) for the paint. I read paint contractor message boards for a few hours, and then asked at the paint store, they recommended mohair because 1) the finish is gorgeous, and 2) my paint is an alkyd which doesn’t jive with a foam. 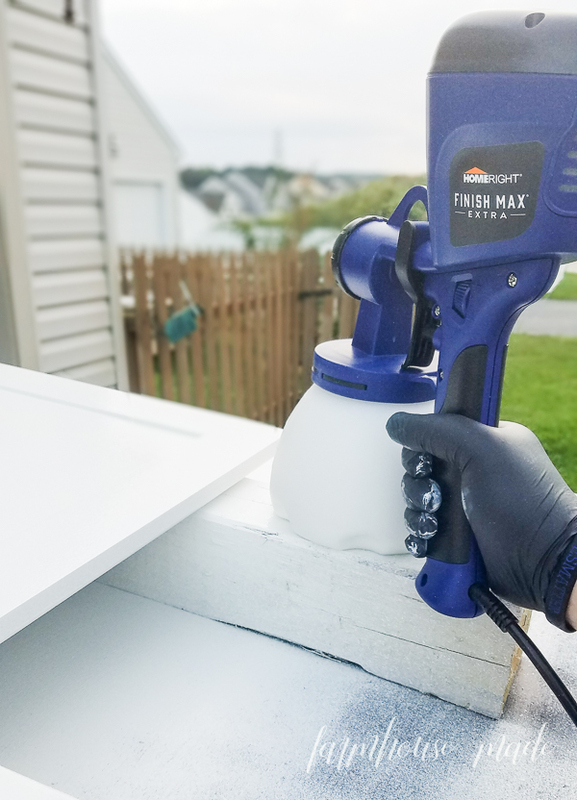 The paint manufacturer may have a suggested method of application too (whether it’s a roller, brush, or sprayer), so definitely check that out first. The foam leaves a nice finish as well, but the rollers themselves don’t hold up very long (they are like those foam brushes that rip in the middles), they don’t hold as much paint as the mohair (or a velour), and the oil-based or alkyd paints don’t apply properly with the foam. If you’re using latex and a sealer, you could def go with a foam. You might also want to try a sample of paint on a door with different rollers/brushes to see which finish and application you like the best! If you have more questions, or anything as you go along, leave a comment or you can email me too! 🙂 I hope you share your before and afters with us!!!! Hoping you are still answering on this thread. This is a great tutorial! I am going to paint over paint on woodgrain cabinets. It seems to me that the last homeowner did not prime, as paint chips off in bit pieces. Or, perhaps the last homeowner did not let the paint cure. 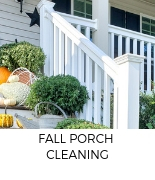 Do you think we need any extra prep steps because we are painting over paint? Hey Jackie!! Thanks so much for your comment! If the last homeowner didn’t prime, and the paint is peeling, I would definitely sand it the best you can. That way, any of the peeling paint will come off before your paint is applied, which will let your paint application last. Otherwise, it will cause your paint to begin peeling too. The original paint could be peeling because they didn’t prep properly, or they didn’t prime, or their paint wasn’t too good. I’d definitely go the extra step to sand in this case! Let me know how it goes, I’m rooting for you! !